If you're a fan of habañero salsa or like to order Thai food spiced to five stars, you owe a lot to bugs, both the crawling kind and ones you can see only with a microscope. New research shows they are the ones responsible for the heat in chili peppers. The spiciness is a defense mechanism that some peppers develop to suppress a microbial fungus that invades through punctures made in the outer skin by insects. The fungus, from a large genus called Fusarium, destroys the plant's seeds before they can be eaten by birds and widely distributed. "For these wild chilies the biggest danger to the seed comes before dispersal, when a large number are killed by this fungus," said Joshua Tewksbury, a University of Washington assistant professor of biology. "Both the fungus and the birds eat chilies, but the fungus never disperses seeds – it just kills them." Fruits use sugars and lipids to attract consumers such as birds that will scatter the seeds. But insects and fungi enjoy sugars and lipids too, and in tandem they can be fatal to a pepper's progeny. However, the researchers found that the pungency, or heat, in hot chilies acts as a unique defense mechanism. The pungency comes from capsaicinoids, the same chemicals that protect them from fungal attack by dramatically slowing microbial growth. "Capsaicin doesn't stop the dispersal of seeds because birds don't sense the pain and so they continue to eat peppers, but the fungus that kills pepper seeds is quite sensitive to this chemical," said Tewksbury, lead author of a paper documenting the research. "Having such a specific defense, one that doesn't harm reproduction or dispersal, is what makes chemistry so valuable to the plant, and I think it is a great example of the power of natural selection." The paper is published the week of Aug. 11 in the online Proceedings of the National Academy of Sciences. Co-authors are Karen Reagan, Noelle Machnicki, Tomás Carlo, and David Haak of the University of Washington; Alejandra Lorena Calderón Peñaloza of Universidad Autonoma Gabriel Rene Moreno in Bolivia; and Douglas Levey of the University of Florida. The work was funded by the National Science Foundation and the National Geographic Society. The scientists collected chilies from seven different populations of the same pepper species spread across 1,000 square miles in Bolivia. In each population, they randomly selected peppers and counted scars on the outer skin from insect foraging. 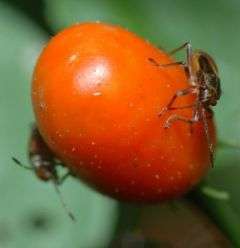 The damage was caused by hemipteran insects – insects such as seed bugs (similar to aphids and leaf hoppers) that have sucking mouth parts arranged into a beaklike structure that can pierce the skin of a fruit. The researchers found that not all of the plants produce capsaicinoids, so that in the same population fruit on one plant could be hotter than a jalapeño while fruit from other plants might be as mild as a bell pepper. But there was a much-higher frequency of pungent plants in areas with larger populations of hemipteran insects that attack the chilies and leave them more vulnerable to fungus. The scientists also found that hot plants got even hotter, with higher levels of capsaicinoids, in areas where fungal attacks were common. But in areas with few insects and less danger of fungal attack, most of the plants lacked heat entirely. In those areas, chilies from the plants that did produce capsaicinoids had a lot less kick because they only produced about half the capsaicinoids as the plants did in areas where fungal attack was common. Using chemical substances as a defense is not unique to peppers. Tomatoes, for example, are loaded with substances that give their unripened fruit a decidedly unpleasant taste, allowing the seeds a chance to mature and be dispersed. But unlike peppers, tomatoes and most other fruits lose their chemical defenses when the fruit ripens. That is a necessary step, scientists believe, because otherwise the fruit would not be consumed by birds and other animals that disperse the seed. The problem with that strategy, Tewksbury said, is that it leaves the fruit exposed to fungal attack. "By contrast, peppers increase their chemical defense levels, or their heat, as they ripen. This is a very different model and peppers can get away with it because birds don't sense pain when they eat capsaicin," Tewksbury said. "I think a lot of plants would love to come up with this way of stopping fungal growth without inhibiting dispersers. It's just very hard to do." The fact that chilies have capsaicin could be the reason humans started eating the peppers in the first place, he said. Chili peppers and corn are among the earliest domesticated crops in the New World. "Before there was refrigeration, it was probably adaptive to eat chilies, particularly in the tropics," Tewksbury said. "Back then, if you lived in a warm and humid climate, eating could be downright dangerous because virtually everything was packed with microbes, many of them harmful. People probably added chilies to their stews because spicy stews were less likely to kill them." All chilies originated in South America, and wild chilies now grow from central South America to the southwestern United States. Explorers carried the plants back to Europe, but they were not widely used there. From Europe, chilies made their way to Asia and Africa, where they have become a common ingredient in nearly every tropical cuisine. "In the north, any adaptive benefit to using eating chilies would be much smaller than at the equator because microbial infection of food is less common and it's easier to keep food cold. Maybe that's why food in the north can be so boring," Tewksbury said. "Along the equator, without access to refrigeration, you could be dead pretty quickly unless you can find a way to protect yourself against the microbes you ingest every day."